ATHENS, Aug. 26 (Xinhua) -- Battered hard during the eight-year debt crisis, Greece's construction and real estate face a long way to revival in the post-bailout era, according to official figures and experts. In pre-crisis Greece the sector was considered as one of the main drivers of growth for decades, along shipping and tourism. Until 2007 investments in real estate accounted to more than 10 percent of GDP, Hellenic Statistical Authority (ELSTAT) data showed. Greece has one of the highest home ownership rates in Europe at more than 80 percent and purchase of a home was regarded as a good investment. In 2016, investments in the housing market was just 0.7 percent of GDP and had cumulatively declined by over 23 billion euros (26.6 billion U.S. dollars) in nine years. "Real estate properties in Greece were not opportunities anymore. 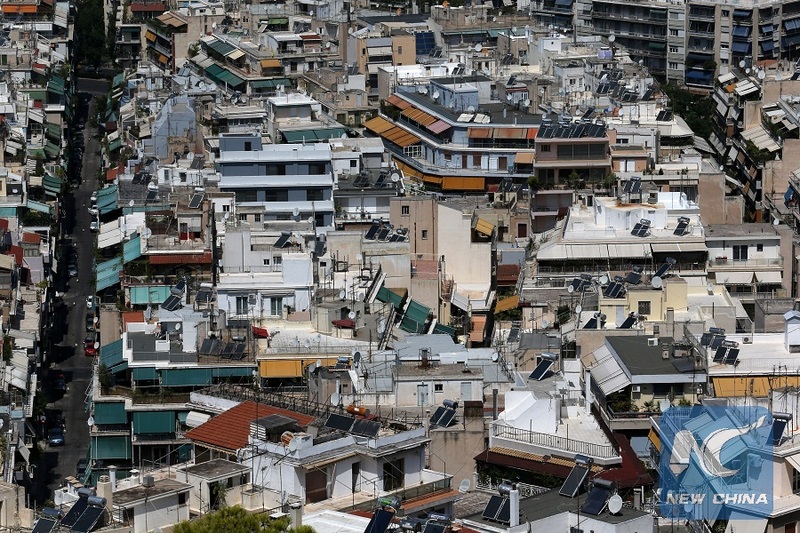 To a large extent they were overpriced and in addition one had to pay significant sums in taxes," Lefteris Potamianos, President of the Real Estate Association of Athens -- Attica, explained to Xinhua. Within less than a decade, according to the official figures, private building activity dropped by 90 percent, and the number of employees in the sector by 83 percent. Residential property prices also took a dive by more than 40 percent nationwide. According to the latest data from the central Bank of Greece, apartment prices are estimated to have increased on average by 0.8 percent year-on-year in the second quarter of 2018. In the five-month period from January to May 2018, building activity was up 5.3 percent in permits compared with the same period in 2017, according to ELSTAT. However, demand still remains sluggish, because for most Greeks the factors behind the dramatic decline are still here, mainly high unemployment rates, disposable income reduced by austerity measures, lack of bank lending and heavy taxes imposed on real estate property. "In 2008-2009, there were 180,000 transactions being made annually. At the worst in 2015 there were only 10,000-15,000 in a year. The decline was huge... Of course now this number has increased, but the gap was enormous," Potamianos stressed. The Greek expert sees signs of recovery, but driven mainly by demand originating from abroad in particular after the launch of the Golden Visa program by Greek authorities in the years of the crisis, given that the housing market is currently undervalued. Non-European citizens who purchase houses worth more than 250,000 euros in Greece and their family members get residence permits. In addition, major companies acquire office buildings and hotels or land plots for construction, he noted. Regarding the substantial kick start of construction, it will take more time, Patamianos added, because of the current oversupply. "When we will reach the moment when demand will be larger than offer, then we will see a real increase in the issuance of permits for construction," he said. As for Greek buyers, he sees them taking small cautious steps. "After so many years of crisis, gradually fear recedes from potential investors so that people are not so concerned what will happen in the future and invest in a small apartment. However, these steps are made slowly with cautiousness," he explained. "Certainly there are signs of optimism, but you never know what will happen based on the past. At the moment we are in a better position, this is a fact," Potamianos said.